Hey folks! Thanks for checking out my blog! 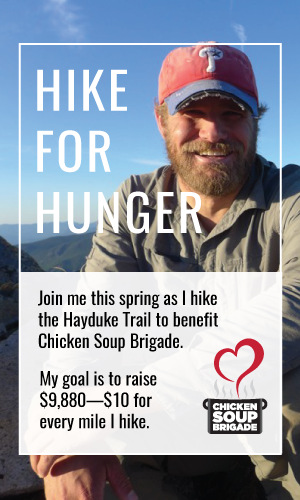 I’m so excited to share my Hayduke Hike for Hunger supporting Chicken Soup Brigade with you! This site is still under construction, so stay tuned and check back in soon, or catch up on my 2011 PCT Adventure! Also- don’t forget to donate $10/mile. All of the money raised goes to support the great work at Chicken Soup Brigade.